You will earn 5,461 Reward Points. Earn 1 reward point for every 1 dollar spent. Features front mounted touch pad control panel with 60-minute digital timer! Mixer is constructed of a rigid cast iron body with front-mounted touch pad controls and 60-minute digital timer with last-batch recall. Mixer has either 1 or 1-1/2 HP custom built motor with overload protection and gear-driven, high torque permanently lubricated transmission consisting of heat-treated hardened steel alloy gears and shafts. Mixer comes standard 30 qt stainless steel bowl, aluminum flat beater, stainless steel wire whip, and aluminum spiral dough hook and non-slip rubber feet. Interlocked with removable stainless steel bowl guard with fully welded ingredient chute. Mixer has #12 attachment hub and interlocked bowl lift. Mixer is NSF and ETL listed. Two year parts and one year labor warranty. SP30 is a gear-driven, high torque transmission with heat treated and hardened steel gears and shafts that easily mix all types of products and improves reliability. The mixer’s rigid cast iron body ensures years of mixer durability. 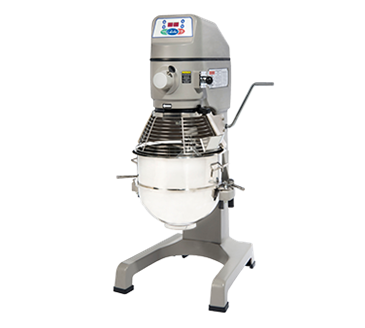 This mixer comes complete with 30 quart stainless steel bowl, flat beater, wire whip, and spiral dough hook. It also has high-quality stainless steel removable bowl guard and easy to attach/remove interlocking guard for easy cleaning. Its digital controls (with 60 minute timer and last batch recall) are conveniently mounted at the front. Now backed by the best warranty in the industry; 2-years parts and labor!